A few people have randomly asked me about poetry lately. I think my fav. publication credit is one in which I did not appear with Bill Knott. These have been on my mind lately. Although I can assure you that sweet imprecision is not something I should be cultivating right now, in light of the hair splitting rigors of bar exam. As is the case with good poetry, a prose explication would vastly exceed the poems. So I'll just post the poems themselves. The Herrick piece is probably more well known, but, as with many things, I prefer Ben Johnson. And not just because of the Horace allusion. Although sic vos non vobis mellificatis apes (Virgil) has been something of a motto this summer. I ought to get it tattooed so I don't forget it. Anyway, I'm off to a brief sleep break before another bar/cram/jam. Here are the poems. Discuss amongst yourselves. Or not. There are many of you out there who are figuring out what MFA program to accept. (Or which law school to accept, or which job to accept.) There’s lots of on-line advice on all of those choices, but I wanted to quickly pitch a couple of pennies into the MFA well. The poet trained in a school of creative writing by academic critics and taking a job in the same atmosphere is more and more tempted . . . to produce work which, more or less unconsciously, is written in illustration of current critical theories; and thus reversing the proper order of nature in which the critical theories arise to deal with the independent raw material of the creative imagination . . . What is really disturbing is when the young lover has the professor in bed with him and knows his performance is being graded as a first or second class honours, pass or fail. Writing is, or should be, a single-minded process. Along with myself, there are some other MFA defenders out there (1) (2) (3) who do a good job articulating what the MFA can be like and what it can do for its students. My advice on selecting an MFA is simply to know what you’re going into it for. A lot of people want to get the MFA so that they can teach creative writing. Well, the job market for teaching creative writing is very. very tight, so unless you’re going to a “top school” in terms of name recognition, you’re probably not going to be in a position where you’re looking at multiple (or any) job offers right out of the program. Well, unless you have a book or two in hand at that point, which kind of begs the question as to why you’re getting an MFA. Ironically, you’ll probably be able to teach CW easily enough – I’ve taught at writer’s groups, community workshops, online for writer’s groups, and online for myself (meaning I take students for fees and teach them.) What you won’t find as a brand new graduate is that tenured professorship in that same institution, replete with tweed jacket. Like anything else though, if you desperately want that life (more than you want anything else) it’s possible to obtain. Just don’t think it’s a default option for your average student. It will require either a lucky alignment of your creative, personal, and professional life, or the subordination of some of those to the goal of teaching CW full time. Not all aesthetics are equally accepted in the various academies. Other people want the MFA simply so they can be better writers. The MFA can certainly help you in this goal, insofar as it will make you a more self-conscious writer, which is often the same thing. Well, if it does not scare you off of writing entirely, which it’s been known to do. In any event though, I wanted to suggest the importance of going to a program that will help you develop along the lines you want to. Again, not all MFA programs are created equal, and they certainly don’t all embrace every personal aesthetic equally. If you want to model yourself after Poet X, make sure that you’re not going to some place which is anathema to that kind of work. That said, most of the better MFA programs will be able to impart a kind of basic poetic literacy, regardless of their dominant aesthetic. While these seem like commonsensical points (they are) I keep running into MFA students who set themselves up for heartache by going to the wrong program. Yes, it’s true that no one should be shackled to a martinet thesis advisor who wishes to only churn out pale copies of themselves – but do what research you can on the programs before going into them. A difference of five grand between program A and program B is irrelevant if only one of those programs will play to the kind of poetical education you’re aspiring to. As to what I think a good MFA can do for you, I’ll include something I wrote back in ’99 in response to a storm of criticism of the MFA on the major online workshops of those days. Lately, primarily amongst web-poets, I've seen the Masters of Fine Arts degree in Poetry, and the programs it arises from, rapped on the pedagogic knuckles. "M.F.A. poets" (those who've attended an M.F.A. program are inevitably amused by that sweeping categorization alone) have no souls, they write about "nothing," perhaps having been granted skills to say "something" but remaining crippled by immaturity and self-centeredness. M.F.A. poets, I am told, are natural sycophants, toadies to the will of their professorial masters, shallow copiers of a bankrupt tradition of personal narrative, confession, and meaningless lyric babble. The overarching tyranny of the workshop is often cited as one of the strong-armed evils of such programs; it cruelly stomps out "real creativity" with a fervor greater than any professional language agency which may have haunted the nightmares of George Orwell. Perhaps these allegations are true for the vast majority of M.F.A. graduates and programs. Having only met a few hundred M.F.A. graduates and read the works of some several hundred more, I'm at a loss to accurately report on the quality of the "average" M.F.A. student's poetry; indeed, I've only begun to scratch total works connected with such programs, given that over a thousand newly minted M.F.A. 's in Poetry /Writing are cracked out of the mold each year. Critics of the M.F.A. program often cite the lack of these programs to produce, in the span of two or three years, poets of the first caliber, but the idea that poets should stroll out of the graduation line, walk back to their apartments and, that afternoon, pen the 40 or so quality poems that would sufficiently impress an editor to immediately publish a volume is surely misplaced. While reasoning by analogy is a particular poetic vice, let's indulge it and consider other Fine Arts programs and other Master's programs. Do we expect music programs to immediately produce "first rate" musicians? Is it reasonable to assume that each graduate of, say, the Berkley School of Music in Boston, will spring into the spotlight of their discipline? Become instant virtuosi? Or that a painter, returning home from her graduation ceremony find their answering machine filled with gallery offers? No. A more just expectation is that graduates will be "reasonably competent" in their field; that they will have mastered basic principles well enough (in theory at least) to instruct fledgling musicians, that they will have a certain technical aptitude in practicing those theories, and so forth. I am thinking of a level of proficiency that correlates with several years of intensive study. Which is, after all, what we’re talking about. The most important skill a program in Fine Arts instruction can impart is the ability to think critically about one's own work; to observe, analyze, advance practically applicable artistic theories based on deduced principles, to evaluate how those applied principals function in their own work. In my own M.F.A. experience, at Sarah Lawrence College, I was encouraged by my professors to take a "cold eye" to my work - to relinquish personal biases and attempt to place myself in the perspective of an impartial reader. This perhaps is the key to writing well, for it allows the writing to be seen by the author as it is seen by the reader and thus the author has more control in refining and shaping the work with a mind to affective qualities. How does this process affect the "wonder" of poetry, the "divine spark" of the muse? Hmm. One of the accusations against the M.F.A. program is that it "drains" the passion of poetry by its scrutiny of the actual words used in a poem (as if critical analysis of any phenomena or work diminished its emotional impact). This accusation of "dulling" poetry is also often applied to discussions of revision. "Those M.F.A poets always revise, but it strips the poetry of passion, dulls the poems," is a complaint I've heard more than once. Of course, there were no concrete examples attached to this argument. . . Again, if you'll indulge reasoning by analogy, this is rather like saying the initial fragments and melodies that sprang into the brain of Beethoven were "dulled" by his arduous reworking of them into their final forms. The vast majority of great poems were not written in one draft; one of the most influential poems of the 20th century, "The Waste Land", by T.S. Eliot, was significantly rewritten by another poet, Ezra Pound, who culled Eliot’s initial thousand odd lines by more than half. The one exception that comes to mind is Frost's "Stopping by Woods on a Snowy Evening," but we should remember that this poem was written in 1923, when Frost was at the height of his powers, and none of his subsequent poems remained in the same form as their first drafts. Granted that the initial spark, the impulse to write a particular poem, is something mysterious and transitory, perhaps not worth inquiring into due to its mercurial nature; however, once the poem is begun, a process, whether conscious or not, begins to guide our creation. We select certain words due to their aptness, or sonic correlation to other words in the poem, or for their conformity to a pattern in which we may be laboring, etc. Even in the moment of creation, our faculties are critical. The revision process -- the critical inquiry, again and again, into the poem -- may be grueling, or joyous, depending on the writer, but it does not "diminish" the poem by itself. This is not to say that unwise choices in revision can't wreck a poem, for they surely can, but rather to assert that the inquiry itself does no damage, for a poem is not (no matter how much we may feel so) a flesh and blood thing. It will not bleed or squeal if we consider changing "spindle" to "bobbin" in line four and having rejected "bobbin", replace "spindle." In addition to failing to churn out "major" poets, to "dulling" poetry via process, I also have heard M.F.A. programs accused of producing poets who "have not a lot to say", poets "who write about nothing." Again, I have to say I haven't done an extensive statistical analysis of what percentages of M.F.A. graduate poets write about "nothing" v. those who write about "something." I'd speculate that many of these complaints have their roots in the proliferation of the "New York" school of poetry or neo-Surrealism, or Symbolism, none of which are native to the M.F.A. programs, or at least not more than, say, Abstract Expressionism can be "blamed" on having arisen from those pesky art schools. There is also the possibility that young poets (shockingly) may have different interests and concerns than the established critics of their day, that while focusing on matters of grammar, or description, or experimenting with imagery, the poems might fall otherwise into one of many conventional tropes. For example, poems which lack specificity - an unknown, genderless, nameless "I" addresses some personal, unknowable message to an equally unspecific "you." But the overarching structure of a poem is also an element of composition, subject to analysis, revision and change. I introduce this to suggest that many writers must master the nuts and bolts of their medium before they can draw up effective blueprints for complete vehicles. When teaching beginning writers, I attempt to make them aware of the basic building blocks of their medium: words. I drill them on how they use verbs, nouns, adverbs and advance to more complex issues of sentence structure. I do not begin by questioning the mode the poems are written in or their affective power, or their place in the tradition of poetry - such can overwhelm the beginning writer. The extended learning process touches on the idea of maturity and development. Again, it's a misconception to expect that M.F.A. programs exist to churn out "finished" artists, when they are structured to enable their graduates to become "finished" artists/poets/whatnots via the application of their education. Often it takes awhile to mobilize what you've learned to the point where it positively affects your writing. Emergence of writers sometime after their M.F.A. is earned is often seen as evidence that "good poets survive M.F.A. programs", as if the M.F.A. program was something to experience negatively, akin to locking musicians up in a bowling alley and expecting them to write symphonies on their release. Thankfully, ours is not such a simply dichotomous world. • Poet/Professor B believes a poem should begin and end outside the "I"
• Poet/Professor C finds fantastic metaphors somewhat "showy"
Therefore all poets graduating form this program will favor ecstatic poetry that begins and ends outside the "I" and eschews fantastic metaphors? Hardly. Some poets will, of course, adopt the style and mode of their teachers, and not all in the spirit of blind obedience and conformity. These poets, working in a vein that their teachers favor, will no doubt have their work easily segued via their teachers' professional contacts into the publication media of that particular style or mode. Would it surprise anyone for an promising apprentice Postmodern painter to have her work hung next to other Postmodern painters in a predominantly Postmodern gallery? Still, other (most) poets from the program will end up writing in a style that is not completely in the vein of their teachers. Regardless of what may be "evidenced" by publication rates of these various groups, it is important to note that all students, regardless of their style, are given the opportunity, via the workshop's structure, to develop the critical skills which lead to writing well. This leads us to consider workshopping. Workshops are a composite of the student's conduct, submissions and attitudes, and the professor's style and knowledge. I have been in workshops which I've found extremely useful and inspiring, only to have these same workshops thought useless and stifling by my fellow students. Conversely, I've been put off by workshops my peers have found invaluable. I've taught students who wished to purse our poetic relationship well after the class, and also have had students (obviously talented and established) abandon courses after two meetings. What I'm trying to suggest is that, on some level the workshop is a completely subjective experience; often the true value of a workshop becomes apparent only after much time has passed. Sometimes, even if only a few lessons are gleaned from a particular class, they prove to be the most valuable in the long run. I remember David Rivard informing a workshop that he was not there "to play the Poetry Doctor"; instead he wanted to teach us to develop and use our own analytical skills to diagnose and treat our work, which for me has become the central tenant of teaching the writing of poetry. There are poets who write to please the dominant personalities of a particular workshop- there are poets who resubmit the same poem to different workshops in the hopes of finding validation, that one critic who says "I love your stuff, for me it's perfect, etc." while some poets play with workshops, submitting fragments their friends have written, nonsense verse, etc. None of these behaviors, as cloying as they may seem to an older hand, invalidates the workshop, for, provided that at least some variance in assessment exists, the poet is offered the opportunity to participate the critical evaluation of her own work, as I've outlined above. For example, someone loves your poem, someone else dislikes the form, another likes the form, yet despairs of the content. Consensus is not important. 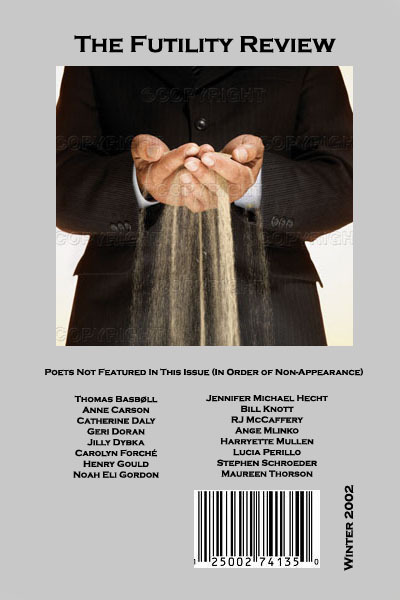 What is important, for the growth of the poet as a critical being, is that the issue of form is discussed, pro and cons are presented, and, like it or not, the poet, usually bound by the "gag rule" of not interfering with the discussion of the poem on hand, will begin to evaluate the issues, the variances. The poet will accept and reject premises and statements. The weakest form of this evaluation will be narcissistic. The poet rejects criticism that seems unfavorable while accepting criticism that praises the work; even so, the poet will begin to view discrete structures within the poem as praiseworthy (use of sound, form, dramatic utterance, etc.) The strongest form of evaluation for a workshop participant is a balanced one that considers seriously the pros and cons of each criticism presented. It does not matter that any particular poem is changed as a result of the workshop, that the class "plays Poetry Doctor" and "cures" the poem of whatever, in the collective opinion, ails it. Instead the value of such review is that the poet deepens her awareness of her own writing process that future poems will benefit (either in composition or revision) from the enhanced sensibility of the poet. Criticism of other's poems is also, in most workshops, mandatory. Again, there are strong and weak critics in every workshop. Strong critics, those that do their best to fairly and unflinchingly evaluate poems will, inevitably, hone critical skills useful (consciously or unconsciously) to their own endeavors. Weak critics, who unfairly point out what poems do not do (every poem does not do something; extended poems are not compressed, nor are compressed poems extended) are at least, perversely, analyzing the poems successfully, if not offering useful strategies for revision. The worst critics are those who say nothing, or unreservedly praise or damn poems, for here there is no attention to the particular elements within a poem, no demonstration of how to manipulate particular parts of poems to affect the whole. At the very least, we might hope that some of their fellow students or professor's remarks are retained for future use, by these writers- however, in closing I must note that none of this is possible without the contribution of reader's responses, which the workshop certainly guarantees. Ultimately of course, it is the future that concerns both professors and students, and the best structured (and it seems to me, also the worst structured) programs do allow the community of reaction that is necessary to begin constructing the patterns of reflection and study that give poets a better chance to write well. Unfortunately, art in general and poetry in particular are not democratic; some individuals (you can argue talent or training or the gods shape them so) are simply better painters or writers or singers than others. It may well be that you cannot train someone to have the initial spark (perhaps it is best so) and that the good poems are those that speak deeply out of the poet's personal sensibility- but it is quite foolish to suggest that individuals who feel this spark, who feel as though they must write, who are happiest in the moment of creation and work that transcends a sense of personal time, and who endeavor always to improve themselves as persons as they improve their art, would not benefit from a program that teaches them to remove their assumed blinders and view their creations critically or, if you prefer, sympathetically from the eyes of their audience. 1) anyone want to give it a read-over and let me know what you think? 2) (not as serious) anyone interested in setting up a submission service whereby you'd cycle out letters/submissions to a group of journals, then resend the rejected pieces to other journals? I think it would be a viable service. I'd certainly drop some change paying for such a thing. But not actually weary, of the same old fight. Much poetry debate bores me recently – has for years. I think this is because I’ve fallen so off the map, or so completely through the map, that I find myself reading good poems for my own pleasure and edification and largely ignoring the rest. Will the sun fail to rise if I don’t read all the lit-mags? Will I myself no longer be able to write or read if I am not abreast of the latest pundit’s terms of the month? Take for example the recent anti-absorbtive/absorbtive debate (mentioned by Brian Campbell). As to the motivation of what animates these debates (apart from the actual positions taken by the debates) I think Brian is right in that the reanimation of these arguments must come from an underpinning of insecurity, a fear of irrelevance, which comes not only from the elitists/fascists/anti-absorbitves but from the populists/luddites/absorbitves as well. Being of the second camp, I admit to hoping the first would just shut up and stop intimidating/infecting young readers. But that’s probably not an accurate picture as to what’s actually going on, so I tend not to engage that dynamic all that much any more. I will engage enough to point out that what strikes me about the scope and framing of these debates is their removal from the common human experience. "The Reader," if thought of at all, is alternately visioned as a mid-life university professor who does nothing but read increasingly difficult texts, or a slightly ditzy elementary school teacher who only reads Billy Collins. The "Dear Reader" of old has gone on to populate the Borders and Barnes and Nobles of the world, where, unsuprisingly, they're reading up a strorm of almost everything but contemporary poetry. By saying this, I don’t mean to categorically suggest that one end of the spectrum ought to be verboten for poets, that we become good socialist realists or platonists of the Republic, but as I wend my unplanned way though a week in the greater NE, I’ve encountered a number of heartbreaking stories: real people, trapped in bad situations, who know, in fact, what they need to do to align themselves with society, with their own requirements for lasting happiness, with the advice they’d give others located similarly. And they just can’t do it. There’s a veritable laundry list of financial pressures, politics, illnesses, drug-addictions, loneliness, legal problems, and so on, which are counterbalanced by an equal number of births, marriages, kindnesses, successful doings and joy. And where does poetry fit into this human drama? Where does an anti-absorbtive/absorbtive debate fit into it? Are people in fact getting their intellectual stimulation and consolation (as the debate would have it) from poetry at all? There are a number of interesting side arguments that I did not get into. In response to e-mail, I specifically wanted to point out that I’m not very much interested in drawing a prose/poetry distinction. I don’t think it’s a very useful one, but if anyone wants to take it up as an intellectual challenge, please be my guest, and I’ll be happy to read your thoughts on the matter. In terms of relative levels of quality or skill creating a divide between poems/nonpoems (which I freely admit I alluded to in the piece), that’s a bit trickier. A fourth grader scrawls out a poem about a boy she has a crush on – poem or not? A mental patient orders their thoughts in lines – poem or not? English Lit. Sophmore pens an embarrassingly stiff and argumentative sonnet – poem or not? But the existence of either of these does not mean there *aren’t* various systems of music (with rules and goals) and various systems of visual arts (with rules and goals). Nobody in their right mind is going to think my shower-yodeling and the lead tenor in an opera house are qualitatively the same thing. Nor is anybody going to look at those notebook pen doodlings of mine and think they’re great art. Even a casual student of Poetics in English could tell you that there have been a number of proposed definitions of poetry over the years- some more personal that others; for Frost poetry was "that which gets lost in translation," while for Stevens, poetry was his "necessary angel." Emily Dickinson knew a poem "because it took the top of her head off," while Yeats knew a poem was finished because it "clicked shut like a box lid closing." Consulting a more stolid source, the various dictionaries, the Miram Webster/Funk and Wagnals types usually go for "a composition in verse," with "verse" further defined as "metrical writing." Yet, as we all know, all writing and speech, by default, is metrical. Which brings us to the idea of definition by lowest common denominator- a thing all poems share which is not shared by any other form of writing. . .Damned if I can think of what this might be. It's difficult to argue that poems should affect the audience in particular ways, primarily because that audience is made up of diverse individuals; provoking, memorable, affective poetry for a 9 year old may not (we hope) prove to be the same to a twenty-nine year old. Furthermore, these individual readers and listeners are in flux; persons, we hope, mature. Tastes change. Given the relative state of the audience, the best definition of poetry might be reflexive; that is, that any given piece, written in any given style, transcends prose and becomes poetry when it clears an internal "bar," when it successfully meets the challenges it accepts. Poems are, of themselves, their own definitions - there are as many definitions of poetry as there are poems. But to cut back to the main question, only some of these poems are going to be at all interesting to the broad and contemporary American adult readership. And when I’m distinguishing Fanning’s poems as Poems, as opposed to flat kinda-poems, I do so with that reader/listenership in mind. When I wrote “Poetry,” I might just as well have written “good poetry,” “poetry that’s worth your time to speak and hear,” “poetry that you really must listen to,” or something like that. And to those of you who responded, I urge you to write into the author of the very next musical review that you read. In it, you should demand that because he hasn't proven that my shower yodeling isn't "music," that he has no business lauding whatever band she's writing about. That would be, I think, a far better way to spend your time. First a disclaimer to frame what follows: In the age of the internet, there’s more access to poetry, more people are writing it, and the overall volume of contemporary poetry has probably grown at a rate faster than the general population’s growth. This means more good poets and poems, but also, frankly, there’s a lot of bad poetry out there. Or just middling poetry. Or people who talk about poetry a lot but never seem to actually produce any really good poems. We all run into these poets, being poets ourselves. And in a world of reciprocity, it’s tempting to publicly say, “Oh, I know X – they’re a good poet,” even though their work might not be particularly good. However, out of some contrary sentiment, I’m generally very cautious when endorsing poetry, as you never know when an otherwise excellent poet will lay a stinker or a so-so-er. (Conversely, I remember my shock when one of the least promising poets in my graduate program produced, in quick succession, at the end of that student’s final year, 3 of the better poems I read during my tenure there.) So there’s just no telling, and I try to carefully vet my good recommendations. Robert Fanning is an exception to that moderately long-winded introduction. He’s a poet whom I’m happy to endorse blindly. Yes. Blindly. He’s that good. He’s that committed. He’s that careful. His new book is called The Seed Thieves, and you can order it though Amazon. Fanning’s poems are some of the most wonderfully lush constructions you could ever hope to vocalize. They transcend clunky rhythm and predictable rhyme; I’ve heard people new to poetry re-read, aloud, his lines for the sheer pleasure of hearing them spoken. While his poems are musical, they are so in the best sense, which means that their lush chains of sound are at the service of the poetry’s deeply informed emotional sensibility. People tend to use the words “lucid” and “compelling” with regards to his poetry, and that’s perhaps because Fanning’s poems have a true sense of inevitability about them. They’re carefully thought out meditations on the human condition with no false steps that dissuade us as we read; the craft of the poems, though completely present, is transparent. Fanning's attention to detail (physical and emotional) means the poems are questioning, bittersweet, tender, and, perhaps, say things we disagree with or which cause us to question ourselves and our reactions. But Fanning’s persuasive passion (and the poems *are* passionate) validates those kind of reactions. We love the poems because while they are sometimes not the things we would say (even in our better moments), they are completely and transparently the things that could or should be said by a human with an unblinking and informed eye. His website has two of my favorite poems of his: Green Stephania and Happiness. They both appear in The Seed Thieves. In keeping with my kvetching about positive reviews, I'll try to use one of those poems to explain what I think Fanning's unique strengths are as a poet. In the meantime, if you're in NYC, you should check him out, live. He'll be reading at the “Readings Between A and B Series” with Marie Howe on Monday, September 25, 2006 at 7:30 p.m. at the 11th Street Bar in the East Village, New York City. He also has a Book Launch at The Harvard Club of New York City on Tuesday September 26, 2006, at 12:30 p.m. Driving directions and maps are available on The Harvard Club site. If there's anyway I can swing it, I'll be there!